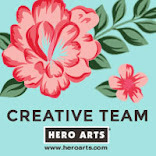 Creativity Within : Hero Arts: November My Monthly Hero and Giveaway! The November My Monthly Hero kit is a fun interactive kit that includes a 4x6 clear stamp with images and sentiments and a 4.25x5.5" holiday cling stamp with a coordinating flap fancy die! 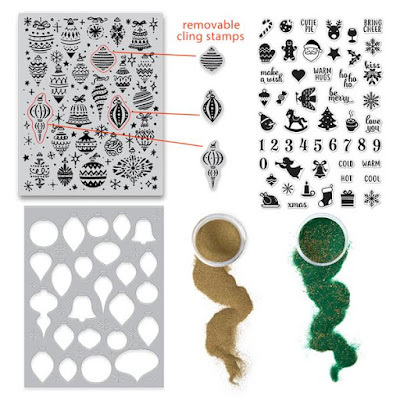 The ornaments cling stamp can be used to create an advent calendar while the clear stamp provides images and sentiments to accent your advent calendar! The cling stamp also has a few stamps that can be popped out to use on their own! 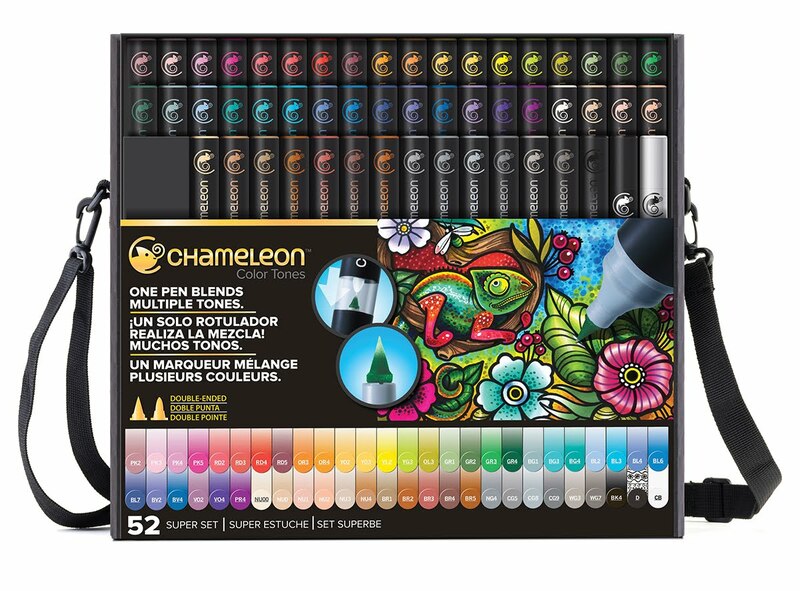 This kit is valued at $60, but is an incredible deal at $34.99. It is available in limited quantities - be sure to get yours before they are gone! Let's start with few ideas that I had on the Hero Arts blog over the weekend and today. Here are few more ideas using the kit. First up is a set of cards and tags using the background stamp along with the clear for the sentiment. I Started by stamping the background on blue and pink card stock. 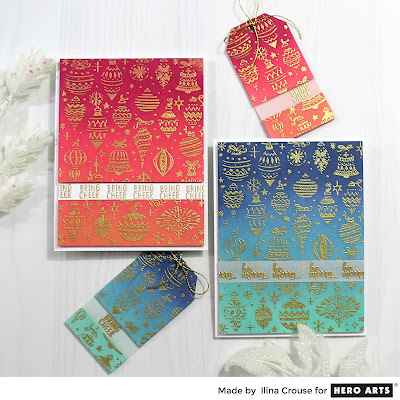 Then embossed with gold and ink blended with reds and blues. Cut the panel, stamped sentiments and assembled my cards and tags. For the second one, I stamped the background onto white card stock and embossed with gold. Trimmed the panel down to 4" x 5 1/4". I popped out the three little ornaments and stamped them separately and embossed with the Green Gold Embossing powder. 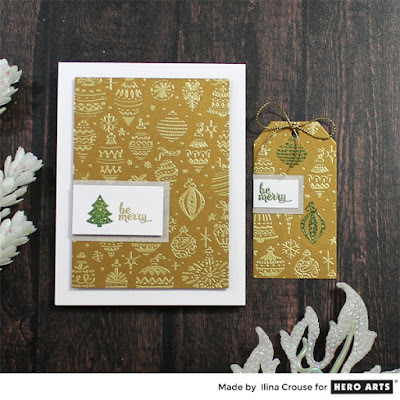 Stamped sentiment and embossed in gold. Die cut using the Circle Infinity dies and assembled my card. 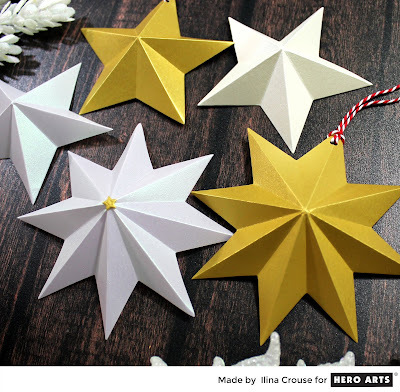 Do you want to make some quick and easy ornaments? The new DIY Ornament Kit is perfect for it. Here are couple ornaments I made using the dies and paper from the kit. 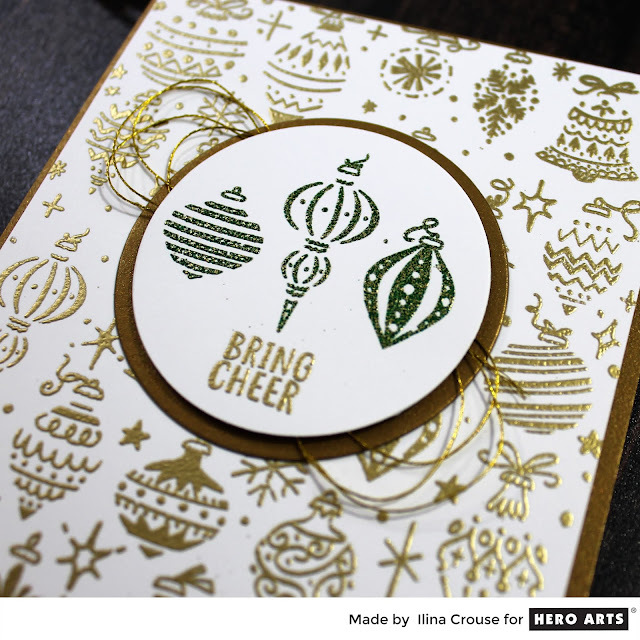 Giveaway: Hero Arts is giving away one kit as a prize to one blog reader - selected from the comments across all of the blogs in the hop. The giveaway closes Sunday, November 11th at 11:59pm, and the winner will be announced the following week on the Hero Arts blog. The matching cards and tags are fabulous! Oh my!! What beautiful creations and so very inspiring! Thank you for sharing! Love them all! 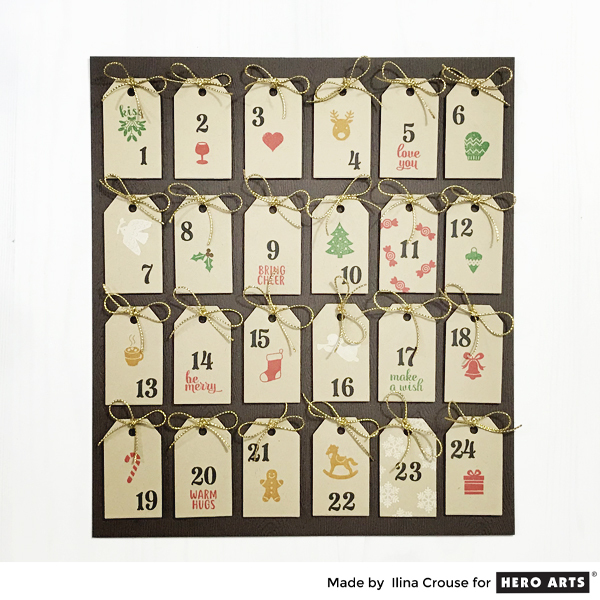 Ilina, I love your Advent Calendar and your cards and tags are awesome. I cannot wait to try all of these things once I get my kit. Thanks for sharing so many great ideas. Love every one of these projects. Thanks for the wonderful ideas. Thanks for sharing multiple project ideas and inspirations! Love the gold embossing! They all turned out great! Thank you for showing us what the various colors look like with gold. I wouldn't have thought the blues would look like that! Thanks for all of the wonderful ideas. I can't wait to get my kit! Very unique and creative cards and tags, beautiful!!! Nice background color blending on the first samples. 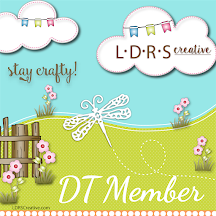 I really like your split cut design, and your blending is so rich and beautiful! These are gorgeous! What a beautiful background! What fun and beautiful cards. Love the bold colors. Lovely cards and tags! You have chosen stunning color combinations. Thanks for sharing all of the great ideas. Oh my goodness, so many example! 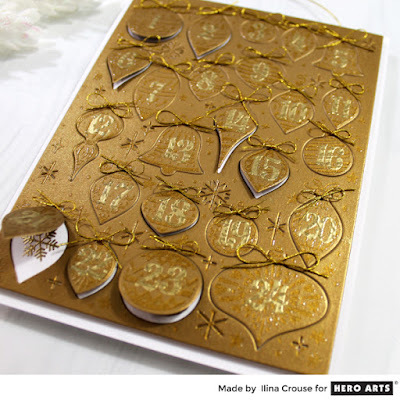 And, I love the use of gold embossing - so elegant. This set is just amazing. Thanks for sharing so many ideas with us! Simply gorgeous. Beautiful! I LOVE what you created!!! I really like the Gold on white card. So striking ! The embossing with ornament stamp is beautiful. Every example I've seen is so pretty. Looks like you had fun with the other items in this release as well. Oh my!!! 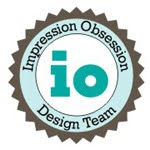 Thank you so much for share these wonderful ideas about how to use this amazing kit!!! Love your projects!!! 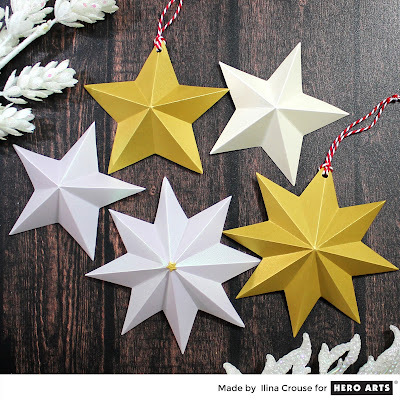 So many sweet projects from tags to cards to ornaments! Love how you split the card panels and tags and then inserted the sentiments in between. 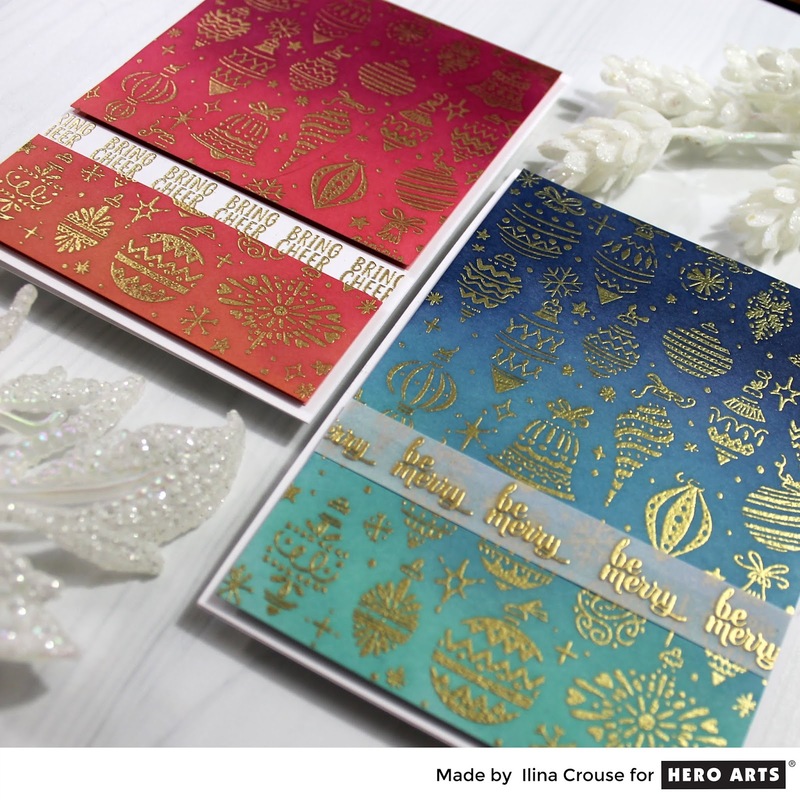 Such gorgeous projects~ love the twist on the advent calendar~ and that green and gold embossing powder - so beautiful! Awesome cards love the colors. Wow, so many wonderful cards with this terrific kit! 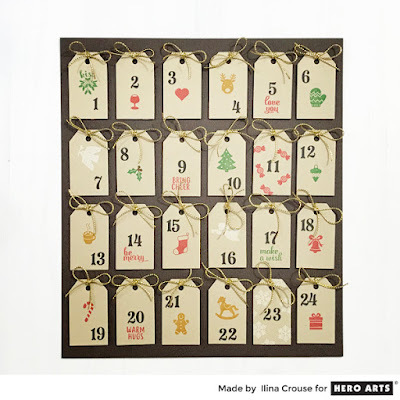 Love the advent calendar! 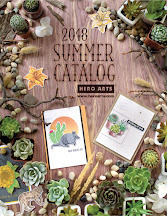 Wonderful, so many ideas here for the cards and calendar. Thanks for sharing. Such wonderful cards, tags and projects. Your creativity is amazing. Beautiful projects! I especially love the matching cards and tags - the colors are wonderful! Great ombre backgrounds. I love the star ornaments. Thanks for sharing such wonderful ideas and designs. It's a good start for when MMH kit arrives. I love all your designs, but this month knocks it out of the park! Thanks! So pretty. I especially loved the coloring on the cards. TFS! Fabulous creations showcased here ... I just had to order never mind what hubby says about shipping! Thank you for sharing so many possibilities with the kit - I loved them all! I love the colors. And the spotlighting you are doing with the cling stamp ... superb. 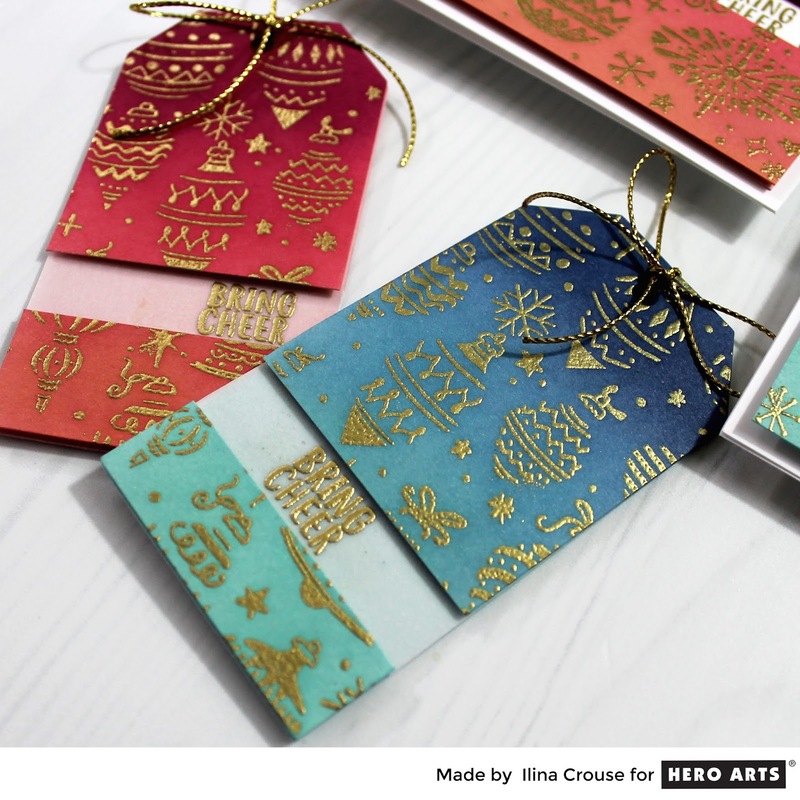 Breathtaking projects - I especially love the ombre inked cards and tags - just gorgeous. Awesome Kit, Awesome projects! I especially love red and blue cards with coordinating tags! What nice projects! I really like those ink blended cards! I love all the creativity and beauty. Good job. Love the advent tags! Gorgeous cards!!!! These are beautiful cards with the different color combinations and ink blending. Wow so many gorgeous projects! 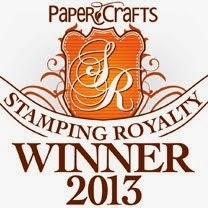 I especially love your gold embossed tags and cards! I love the reds and blues that you blended for over the two color shades! Very elegant looking! I like the blending, and where you used the ornament stamp as a background.